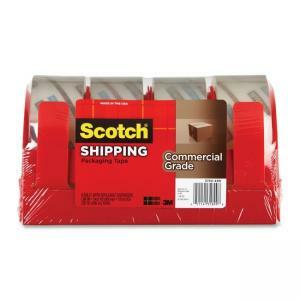 Packaging tape is great for box sealing, splicing and other demanding packaging applications. Adhesive is made of aggressive hot melt rubber resin that allows tape to stick instantly and hold tightly. Tape resists center seam splitting and tearing and seals out moisture, dust and dirt. Packaging tape includes a reusable dispenser and meets U.S. Postal Service and UPS requirements for standard packages.